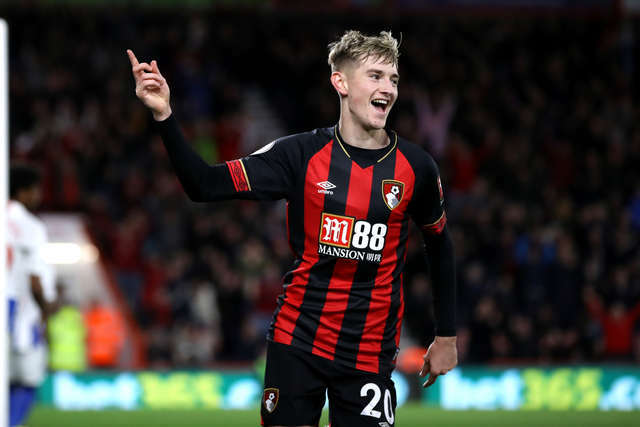 AFC Bournemouth had eight players in action for their respective loan clubs over the weekend. Emerson Hyndman was the stand-out performer, getting on the scoresheet as his Hibernian side beat Hamilton 6-0 at home. The American played 66 minutes and scored the third goal for his side, after receiving the ball from the left, allowing it to run across his body and beautifully caressing it into the far corner. Hibernian now sit second in the SPL, two points off top, with a goal difference of +13 after just eight games. Elsewhere, Harry Arter played 90 minutes for Cardiff, as they travelled to Wembley to face Spurs. Eric Dier’s eighth minute goal was enough to give the hosts all three points. Sam Surridge, who has already bagged seven goals this season, also played 90 minutes, but his Oldham side couldn’t beat Carlisle, losing 3-1 to the northern outfit. Staying in League Two, Matt Worthington’s Forest Green Rovers side maintained their unbeaten start to the season, drawing 1-1 with Newport County at home. The Cherries midfielder played eight minutes. Connor Mahoney also came off the bench for Birmingham City, who beat Rotherham 3-1 at St. Andrews. The midlands side haven’t lost in eight league games. In the National League, Tyler Cordner played his second consecutive 90 minutes for Havant & Waterlooville, but Lee Bradbury’s side lost 1-0 to Wrexham. Weymouth moved top of the Evo-Stik League Premier South with a 1-0 win over local side Wimborne Town, Cherries defender Sam Sherring playing 90 minutes for Mark Molesley’s side. Elsewhere, Mikael Ndjoli was an unused substitute as Kilmarnock defeated Dundee 2-1, while Brad Smith’s Seattle Sounders play tomorrow. Price reduction on all official replica home kits now!